The first major public occasion of HER MAJESTY the Queen’s Diamond Jubilee was an occasion celebrating the contribution of faith to our society, encouraging active co-operation for the common good by all faiths and none. Building on the momentum of the UN’s declared annual World Interfaith week (1st–7th February), Her Majesty the Queen attended the multi-faith reception at Lambeth Palace, a historic London residence of Archbishops of Canterbury since the 13th Century. Hosted by Archbishop Rowan Williams, Her Majesty was greeted by representatives of the eight non-Christian religions, who gathered together to express their respect for Her Majesty as Monarch and affirm their commitment to one another in dialogue and to the service of the nation as a whole. Sikh guests presented a beautiful painting of Maharaja Ranjit Singh, the Sikh Maharaja from1797-1839. During his reign all faiths were equally respected in Punjab, India. Maharaja Ranjit Singh had the Sikh place of worship Harmander Sahib (Darbar Sahib) gold-gilded (between1803-1830), where the eternal Guru of the Sikhs, Guru Granth Sahib Ji was enthroned for eternity in 30th August 1604. Reflecting on the event, Bhai Sahib Bhai (Dr) Mohinder Singh, Chairman of the Guru Nanak Nishkam Sewak Jatha (GNNSJ) & Nishkam Centre commented that: ‘It cannot be denied that a renaissance of religious traditions is taking place virtually all over the globe. It was an honour and privilege to greet and speak to Her Majesty, who remembered the visit to Harmander Sahib in October 1997. GNNSJ had completed 65% of the gold-gilding of ‘Darbar Sahib’ 165 years after Maharaja Ranjit Singh carried out the regilding’. 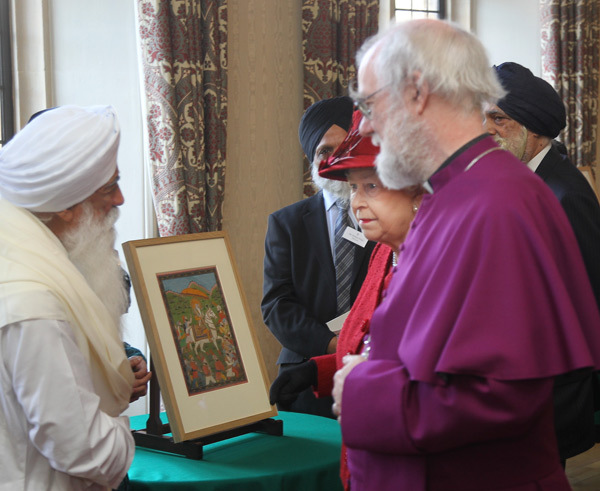 Photo caption – Bhai Sahib Dr Mohinder Singh displays the painting of Maharaja Ranjit Singh to her Majesty the Queen.